About Blog Interweave's Weaving Today is an online community and resource for yarn and fiber lovers everywhere! Meet other weavers, learn new weaving techniques & browse new weaving projects. We'll be bringing you new articles, tips and inspiration every day, so stay tuned! Facebook fans 16,751. Twitter followers 28,221. About Blog Hi I'm Kate. I've created this blog to share my love of weaving and help creatives like you learn how to weave too. Here you will find posts for how to weave, how to do different techniques and much more. Seattle, WA, U.S.A. About Blog Mirrix Looms are primarily meant for bead weaving, tapestry weaving and bead and fiber combination, but can be used for anything from wire-weaving to rug-making. Facebook fans 5,610. Twitter followers 761. San Francisco, CA About Blog A sub reddit for discussion regarding weaving, looms, weaving drafts and related subject matter. Facebook fans 1,121,193. Twitter followers 490,221. Boulder, CO About Blog Here at Schacht Spindle Company we are deeply committed to excellence in our work, and above all, to your satisfaction. Today, we build our looms in a 35,000 square foot factory with 25 employees, and are one of the world's leading makers of handweaving looms and spinning wheels. We have been designing handweaving and handspinning equipment since 1969. Facebook fans 3,570. Twitter followers 279. About Blog The Weave Shed is a website for weave designers with a portfolio practice, payee, mills, independent, designer makers, tapestry, artists, educators and students. The site was initially funded for the for the first two years by The Worshipful Company of Weavers and Central Saint Martins, University of The Arts London. Facebook fans n/a. Twitter followers 1,167. About Blog Take your old newspaper and recycle it into something that can be used in your house. By making baskets out of woven newspaper, you can create several different sizes, styles and types of baskets. Paint the baskets so they match your decor. With just a few items and some patience, you can use that newspaper for something other than filling up the recycling bin. About Blog I'm a weaver who is fascinated by the potential of cloth. I began my weaving career with handwoven garments, such as my Kodachrome Jacket (featured on the cover of Handwoven Magazine), and my handwoven, couture-sewn wedding dress (now part of the permanent collection at the American Textile History Museum). About Blog Peggy Osterkamp’s special skill is making the richness of her training and experience accessible to students. In the series, Peggy Osterkamp’s New Guide to Weaving, she presents a wealth of weaving knowledge and research, much of it never available before in the United States. Seattle, WA About Blog Weaving Works Founded in 1974, owner and professional weaver, Marcy Johnson, opened the store in a small corner shop in Seattle’s University District to supply her students and local weavers with affordable quality materials. Over the years, The Weaving Works has grown into a store and school supporting all aspects of the textile arts. Facebook fans 1,991. Twitter followers 146. About Blog Hi, I am Karen Isenhower. Handweaving is a field rich with these treasures, and I enjoy sharing what I find. I’ll let you know right up front that I’m still learning, that I don’t always know what I’m talking about, and that I do make mistakes. Here you will find weaving patterns for your own projeects. Facebook fans 2,385. Twitter followers n/a. Facebook fans 6,281. Twitter followers 319. Asheville, NC About Blog Matt Tommey makes North Carolina baskets for modern rustic decor out of natural materials straight from the mountains of Asheville. Facebook fans 505. Twitter followers 756. About Blog Hi, my name is Andrea. I'm a self taught passionate free-form weaver, hand spinner and creative thinker based in Melbourne's south east. In Loom & Spindle blog you'll find a range of weaving and spinning tutorials that will help and inspire your own projects. Facebook fans 426. Twitter followers 45. Old Bar Beach, Australia About Blog Curiousweaver studio is woven together by Kaz (Karen) Madigan. A weaver for almost 40 years, since 2011 she has been specialising in Saori weaving and is the first registered Saori studio in Australia. “As a weaver for many years I have explored and tried many types of weaving. I love it all. I’ve walked in shoes of the artist, craftsman, designer, maker, author, teacher and artisan. Facebook fans 1,356. Twitter followers 174. Rochester, NY About Blog I live in Rochester, NY, where there's lots of water -- Lake Ontario, the Genesee River, and the wonderful Finger Lakes -- and lots of winter! Weaving and the fiber arts sustain me through all the seasons. Facebook fans 176. Twitter followers 2. About Blog I'm Alice Schlein, a weaver and book maker in South Carolina. Occasionally I write about Photoshop, Network Drafting, bread baking, and whatever else strikes my fancy. West Kilbride About Blog I am a textile designer and I create unique weather inspired handwoven items for you and your home. I also teach weaving, spinning, and other yarn related crafts at my studio in West Kilbride. Facebook fans 736. Twitter followers 830. Arroyo Seco, NM About Blog A weaving blog of Weaving Southwest. Facebook fans 2,733. Twitter followers 655. Fort Collins, CO, USA About Blog I am a contemporary tapestry weaver. I hand-dye all my own yarn to get the color gradations I love, and I weave most of my tapestries on my grandfather's Harrisville rug loom. Facebook fans 1,988. Twitter followers 442. About Blog I am an artist, designer. I am passionate about the fiber arts: I love love love small loom weaving, crochet, knitting, spool knitting, tatting, doll making, spinning, and woodworking that relates to the fiber arts. About Blog I am a hand-weaver. I believe that cloth and its creation are somehow embedded in our DNA. Making cloth seems fundamental to me; I am saddened by the distance we have created between the fabric that means so much to us (wedding dresses, christening gowns, tallitot, baby blankets and grandma’s quilt) and the making of that fabric. Mumbai About Blog Vritti is a merge of traditional illumination where ethnicity meets modern trend. The word ‘Vritti’, originates from Sanskrit language, which means a serene wave emerging from mind which eliminates the evil mental disturbance and allows you to indulge into eternal peace. Facebook fans 877. Twitter followers 163. About Blog In 1975 I was looking for a career that would fascinate me for the rest of my life. In a way, weaving chose me! In this blog you will find posts for weaving. About Blog In May 2009, I had started this blog to record my adventures while completing an artist residency at Sturt, Mittagong, on the Southern Highlands of New South Wales, Australia. The residency finished in September. I have had such enthusiastic response from what I wrote that I have decided to continue to record my adventures both in and away from the studio. About Blog Stacey Harvey-Brown has been teaching weaving since 2005, firstly at The Loom Room in the UK and now, from her new studio near Nérac, in the heart of Gascony, SW France. Facebook fans 912. Twitter followers n/a. About Blog Deanna Jill Deeds is a Weaver, dyer, spinner, worker of sprang and other fiber techniques! About Blog I’m Margaret Cherre, the artist behind Second Wind Weaving. I do all of the designing and weave every piece by myself, working in my home in upstate New York. Handweaving is my passion. I love working with a wide range of fabrics, experimenting with colors and textures, widths and lengths, weaving patterns and methods. About Blog My name is Meg Nakagawa. I am a handweaver in Nelson, New Zealand. I grew up watching my mother knit, sew, and embroider while listening to her chant how she yearned to weave. That weaving is the ultimate textile work thus became my creed. Mom started weaving when she was 60. Scotland About Blog My name is Cally Booker and I am a handweaver, textile designer, writer and teacher. Weaving is a craft which can be meticulously planned or improvised at the loom, and a combination of these approaches appeals to the different parts of my nature. I am passionate about making things by hand. Facebook fans 1,254. Twitter followers 381. About Blog Weave a Real Peace (WARP) is a networking organization of weavers, academics, and interested supporters who value the importance of textiles to communities around the world. Facebook fans 1,624. Twitter followers 269. About Blog Tara J Curtis creates multi-dimensional, functional fabric art for the home using classic and madweave techniques. An enthusiastic teacher, Tara is dedicated to helping other sewists incorporate weaving into their projects while teaching them a new skill. She is the inventor of the WEFTY, the only needle made by a weaver designed specifically for use with fabric strips and bias strips. About Blog A Weaving blog. About Blog A blog about weaving. About Blog A Weaving blog by Nigel. About Blog Pink maharani was started with the values that we create something where we place people, animals and the planet always first. We do this by not compromising on neither quality nor aesthetics. We strive to make the finest handwoven cashmere, which is both beautiful and impactful. Toronto, Ontario About Blog Handwoven Scarves & Textiles, Weaving a journey to remember. Designed and hand woven on a traditional floor loom by Canadian designer/handweaver Dani Ortman. Facebook fans 363. Twitter followers 24. About Blog A journal of my weaving, spinning, and knitting life. About Blog Contemporary Handweavers of Houston (CHH) is a non-profit educational organization dedicated to promoting interest in handweaving, spinning and related textile arts. London About Blog Stitch by Stitch creates contemporary handmade soft furnishings, cushions, quilts, blankets, and rugs working with artisan weavers, embroiderers and quilt makers in Kutch, Gujarat, India and Nepal. We are especially interested in hand woven, hand spun, natural fibres, traditional textile techniques, natural dyes and reinterpreting age-old textile skills to create modern textiles. Facebook fans 1,288. Twitter followers 716. About Blog The Artist's Path that is so much my way of being in the world. Each morning I sit at the loom and enter into the eternal moment, where my hands place strands of color into taut warp. The tapestry slowly grows as I work section at a time, weaving areas of cloth to create the image in a syncopation of threads, shapes, colors and textures with the language of the loom. About Blog Wonder Woven LLC is a weaving studio in Santa Monica, CA focused on crafting beautiful and comfortable wraps for wearing your baby or toddler. It is the creative endeavor of Tracy Desrosiers Bromwich, a liscensed architect and mother of 3. Facebook fans 3,407. Twitter followers n/a. About Blog Between the sewing machine and the loom, my journey in the fiber arts has taken over 45 years. From an alterations business at 15, to production hand-woven clothing, to custom art to wear, my work has covered, adorned, and embellished the female body for as long as I can remember. About Blog I am a professional weaver, specializing in complex weaves using fine threads. Most of my studio work consists of scarves, shawls, and wraps woven on a 48-inch, 24-shaft computer-assisted AVL dobby loom or wall art woven on a 48-inch, 1,440-heddle AVL jacquard loom. About Blog A journal about my weaving 'meanderings'. I have been weaving now for twenty years. I like finer threads and natural fibres such as silks and exotic blends, linen and cottons. I also love tencel and its bright colors. About Blog A Weaving Blog by Michiele. About Blog Hi, I am Lynnette. My goal is to get my "bum on the weaving bench" as often as possible. I love to see huge dust bunnies growing under my loom as the fibres fall from my reed, a sure sign that I'm actively weaving! My primary focus is to create beautiful and unique fashion accessories and table linens for sale. About Blog Global manufacturer of technologically advanced, finely crafted weaving equipment for the novice to the expert. AVL serves customers in the crafts, education, industrial sampling and production handweaving markets. Facebook fans 5,666. Twitter followers n/a. About Blog My handwoven work is inspired by the countryside around me. I live now, and grew up, in the west country. This is the story of how I came to weaving. I was a little feral as a child. The countryside is in my bones, part of my blood and I can't help but let it be part of my thinking. Facebook fans 2,003. Twitter followers 340. About Blog Hi! I'm an avid weaver and love to share my yarny passions with others. I hope you enjoy my videos! Facebook fans 1,863. Twitter followers n/a. About Blog My weaving studio is in the historic town of Odemira in Portugal. I am a passionate hand weaver. Facebook fans 1,279. Twitter followers n/a. About Blog I am an 'older' woman, who refuses to get old. I think I am really twelve, and my family will often agree. I have found my passion in weaving, and have left one career to begin another. Royal Oak, Maryland, USA About Blog Fine art tapestries designed and handwoven by tapestry artist Ulrika Leander for public and corporate buildings and private homes. Facebook fans 761. Twitter followers 11. About Blog A blog about handweaving group in Nevada County, CA. Facebook fans 697. Twitter followers n/a. About Blog Hi! I'm a weaver, healer, and mama living in a log cabin in the woods in Alaska. I create artisanal textiles for caregivers, households, and wardrobes crafted with love and deep intention. About Blog My weaving ranges from classic and earthy to funky and energetic. I use heathery Shetland wools, soft but sturdy cottons, and my own handspun wool and alpaca. From the spark of an idea through to the meticulous fringing or hemming, my handwoven items are designed, produced and presented with joy and delight. Facebook fans 404. Twitter followers n/a. About Blog I'm a lifelong knitter who came to weaving later in life, thanks to my kind husband who gifted me with a rigid heddle loom one Christmas. I started selling handwovens for the home, such as tea towels, placemats and runners, as well as intricate, silky scarves and shawls. Facebook fans 383. Twitter followers n/a. 65. My Gentle Threads. . .
Virginia Beach, Virginia About Blog Welcome to my sacred space! I am entering my fifth year with my blog and it has been an incredible journey for me. I love to share my creative adventures, poetic words and photographic moments about weaving. About Blog Handweaving blog by Beryl Moody. About Blog The Hand Weavers Guild of Lincoln (HWGL) is a diverse group of beginning to advanced weavers and artists who share an interest in the art of handweaving, spinning, and other fiber arts. The Guild offers educational opportunities and the exchange of ideas. New Hampshire About Blog Kate Kilgus, Londonderry, New Hampshire artisan, creates handwoven wearables and home decor under her label, Nutfield Weaver. Facebook fans 236. Twitter followers 501. About Blog My love of color and texture has taken me on a journey from being a glass artist to the fiber arts world. For the last 10 years I have explored spinning, dyeing and weaving. With a side trip into owning a yarn shop for a few years, I am now back to creating fine handwovens, handspun and hand dyed yarns, in my log home studio in the beautiful hills of southwestern Wisconsin. Facebook fans 215. Twitter followers 57. About Blog I am a weaver. This blog will chronicle my experiences in weaving and other fiber crafts I enjoy. About Blog I enjoy almost all aspects of the art and craft of weaving yarn into cloth, looking at both color and structure as they influence the final product. About Blog We are the Tuesday Weavers, a lively group of weavers from all levels and all walks of life. We meet every Tuesday at the Appalachian Arts Craft Center in Norris, Tennessee for weaving, learning, fellowship and a lot of laughter. About Blog The Qualicum Weavers and Spinners Guild supports personal growth in the fibre arts through study groups, workshops, mentoring and sharing of experience. About Blog Part architectural designer, part fiber artist. Living in Portland, Oregon, I've learned what it's like to chase landscapes and immerse myself in the beauty of the Pacific Northwest. I think of my loom as a way to translate the terrain into fiber design and explore this woven lifestyle. About Blog Welcome to my weaving studio located in the lovely rural community of Metamora, IL. I am a handweaver who delights in weaving heirloom textiles. About Blog A weaving blog by Cindie. In this blog you will find ideas and new inspiration for weaving. About Blog My journey into weaving began by watching one grandmother crochet, another quilt, seeing the rag rugs woven by my parents on the old loom in the basement. Weaving satisfies a curiosity for me. Beautiful textiles intrigue me and make me wonder how they “work”, how the weaver gets the threads to do what they do. And how can I use that technique? About Blog A handweaving blog by Tina J. About Blog I am a designer weaver and love to use natural yarns in my work, such as linen, silk, alpaca, cashmere and merino wool. I am fascinated by the long history of weaving and research ancient textiles and the techniques used to produce them. About Blog Rep Weaver blog about hand weaving and related crafts including tatting, sewing etc. About Blog I am a handweaver and teacher of traditional textiles crafts, such as weaving, spinning, felt making and crochet. About Blog We design and hand weave fashion items for the person and the home. About Blog I am an artist who observes and responds to my surroundings for inspiration. My primary artistic medium is handwoven tapestry, an ancient method of working with fibers to create images. About Blog The name Weaving Tales was inspired by a dear college professor who loves to compare knitting and weaving with the construction of a literary text. Leah hopes this blog will explore the limitless potential of creativity by which we weave the words, the fibers, the stories, and the fabrics that piece together life. About Blog In my weaving and embroidery I explore the potential of the forgotten, overlooked and abandoned. I revel in discovering humble, quiet fabrics like calicos and cottons; the more worn, faded and story-laden the better; and giving them a second chance. About Blog K Spoering is a Contemporary tapestry designer and weaver, oil painter. About Blog A blog about hand weaving, tapestry, and the place of craft and art in contemporary life. About Blog This blog Provides information on meetings and program for a weaving spinning guild. About Blog I am a fiber artist. I create 3 dimensional weavings using reclaimed and recycled materials. I love to create tapestries that are stories of the world around me - people I've met, places I've been and things that make me smile. About Blog It has been a dream of mine to learn weaving, ever since I was a child. My opportunity came early in 2005, when my sister-in-law let me borrow her countermarche loom. I had a couple friends help me understand the loom and get me started. Those first couple projects were exciting for me. About Blog Dianne is passionate about fibre and weaving. She weaves exquisite fine wraps, scarves and fabric and scrumptious mohair blankets from natural fibres. About Blog A resource for practicing and aspiring fiber artists in and near Carson City, Nevada since 1976. About Blog A weaving blog of the what, why and how of the work I have been doing. Here you will find artcils about weaving and weaving equipment. About Blog I am a professional weaver from the south of Sweden. About Blog Our mission at Stitch & Loom is to offer you the perfect rug and other woven goods ethically and sustainably. We partner with skilled artisans who handcraft textiles using sustainable materials and traditional weaving methods. About Blog Weaving became part of my life in 2009, and, in the beginning my desire to weave was born because I wanted to fill my home with practical handwoven articles. Things that I could hold, touch, use and enjoy on a daily basis. I look forward to sharing my weaving journey with you … warts and all ! About Blog A blog about the Reno Fiber Guild - weavers and spinners organization in northern Nevada. About - Hi I'm Cally Booker and I am a handweaver, textile designer, writer and teacher. Weaving is a craft which can be meticulously planned or improvised at the loom, and a combination of these approaches appeals to the different parts of my nature. I am passionate about making things by hand. About - Stitch by Stitch creates contemporary handmade soft furnishings, cushions, quilts, blankets, and rugs working with artisan weavers, embroiderers and quilt makers. We are interested in hand woven, hand spun, natural fibres, traditional textile techniques, and natural dyes. About - Skye Weavers is a weaving and sewing business working on the Isle of Skye. On their bicycle pedal-powered loom we weave a variety of woollen products including scarves, blankets, throws and wraps. We also make tweed, which we sell as lengths and makeup into garments, cushion covers, bags and accessories. About - The Weaving Space is a programme of workshops, activities, and resources led by Dundee-based handweaver Cally Booker. As well as hosting classes in her fully-equipped studio in a refurbished jute mill, Cally travels to Guilds and groups around the UK to teach the art and craft of weaving. 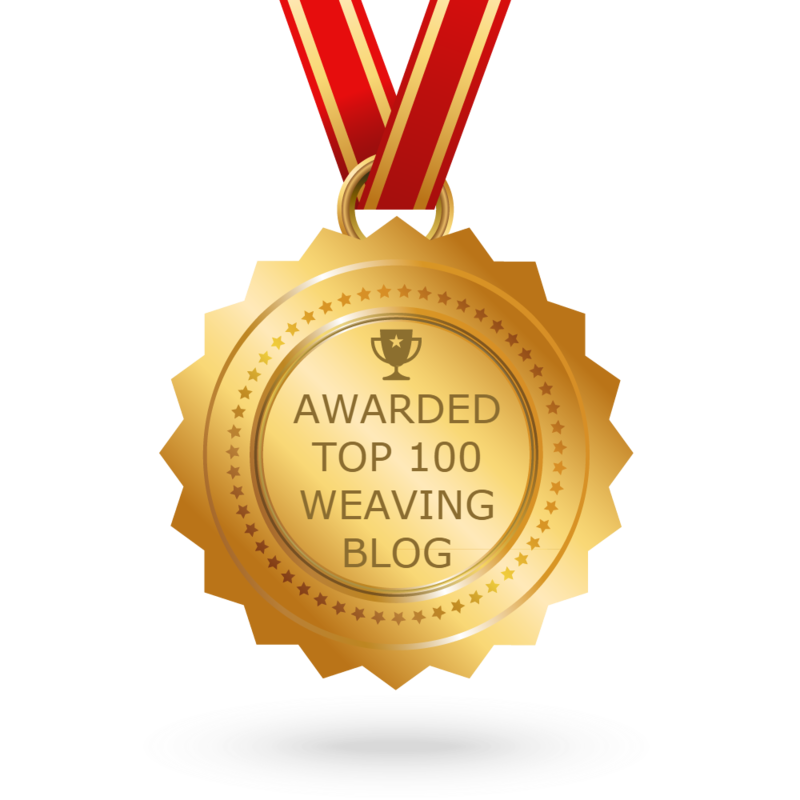 CONGRATULATIONS to every blogger that has made this Top Weaving Blogs list! This is the most comprehensive list of best Weaving blogs on the internet and I’m honoured to have you as part of this! I personally give you a high-five and want to thank you for your contribution to this world.